Increased CRMP-2 Phosphorylation is Observed in Alzheimer’s Disease: Does This Tell Anything about Disease Development? Alzheimer’s disease (AD) is an incurable, progressive, degenerative and fatal disease that afflicts over 36 million people worldwide, and this figure is expected to quadruple by 2050. Epidemiologic data indicate we are on the precipice of a global epidemic of AD; yet, unfortunately, current treatment options are only provide short term symptomatic relief. The major aim of the series Advances in Alzheimer’s Research, from Volume 1 and continuing to Volume 2, is to present a combined approach to AD from mechanistic, clinical and translational research and discuss the important information on the cause, progression and prevention of AD. This volume is not meant to report exhaustively on the many other research efforts in the broader AD research arena. Its primary objective is to discuss and highlight improvements toward the diagnosis and potential treatment of AD using both recognized and novel strategies. This book series, including the present volume, offers a unique platform to a range of scientific interests and expertise, specifically focused on AD and related disorders. A major attempt is undertaken to disseminate the most current knowledge on recent advances in AD research. 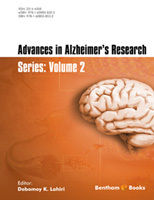 The volume 2 compiles selected articles previously published in Current Alzheimer Research (CAR) and are updated for this volume. The selection of subject matter comprises a collection of diverse research articles that are representative publications in CAR. They cover forward-thinking and provocative ideas, enthralling to read for those both in the AD field and outside of it. It is pleasing to obtain 15 exceptional contributions that create the present issue to skillfully achieve this. The etiology of AD is being slowly understood. The contribution of gene and environment, including education, physical activity and lifestyle, are important for the most common cases of sporadic AD. Another heavily investigated aspect is mechanism(s) of amyloid plaque deposition. One of the most noteworthy recent approaches to amyloid plaque involved removal of brain amyloid-β peptide (Aβ) using anti-Aβ antibodies. Aβ immunotherapy emerged as a promising treatment strategy based on human neuropathology and preclinical studies. The characteristic deposition of parenchymal and vascular amyloid-β peptide (Aβ) pathology detected in the brains of AD subjects suggested a logical target. However, there were several recent setbacks at the clinical trial stage, and some these issues and other developments have been discussed recently in Current Alzheimer Research (Vol. 11, 2014). This volume comprises 15 chapters written by a group of eminent experts in various aspects of AD research. In short these chapters capture recent advances that can be broadly grouped into eight major important areas. 1) memory and consciousness, 2) proliferation (cancer) vs. degeneration (AD), 3) risk factors for AD (such as dietary, e.g., cholesterol, and environmental, e.g., metals), 3) pharmacological intervention (e.g., cholinesterase inhibitors), 4) nonpharmacological approaches (e.g., music), 5) neuroprotective strategies (e.g., heme oxygenase-1 suppression), 6) biomarkers (e.g., Cytochrome C) and detection, 7) Morphological studies(such as spine pathology and laterality of the affected AD brain , and 8) Caregivers’ perspectives. The first chapter deals with memory, awareness and consciousness relevant to AD. Specifically, the authors (Souchay and Moulin) provide an overview of the brain regions supporting conscious experience of memory and suggest that the memory and awareness deficits observed in AD may be viewed as a deficit in autonoetic consciousness. At the cellular level, Behrens et al. describe common biological mechanisms in AD and cancer. For example, epidemiological data suggest an inverse association between AD and cancer, such that the risk of developing cancer is significantly lower in AD patients, while cancer patients have a lower risk of developing AD. At the molecular level, Behrens and colleagues discuss the roles of some specific signaling pathway, and the process of adult neurogenesis as potential candidates, which may explain an inverse association between AD and cancer. Several risk factors are known for AD, and some are controversial. A provocative chapter (Stefani and Liguri) discusses the role of cholesterol as a susceptibility factor or a protective agent in neurodegeneration and, especially in the context of amyloid-induced cytotoxicity. Epidemiological studies on the hypercholesterolemia-AD risk relation and beneficial outcomes of statin therapy studies suggest cholesterol as a susceptibility factor in AD. However, reduction of cellular cholesterol favors co-localization of BACE1 and APP in non-raft membrane domains and inhibits production of the Aβ-degrading enzyme plasmin. There is also a reduction of the cholesterol/phospholipid ratio in aged and AD brains. Stefani and colleagues ably tackle both sides in this field by supporting both roles of cholesterol either as a susceptibility factor or as a protective agent in AD. Apart from cholesterol, environmental factors, such as metals, can play a role in the etiology of AD. AD fits to a major class of diseases, called amyloidoses, in which endogenous proteins or peptides undertake a misfolding process changing from soluble physiological configurations to a pathological fibrillar insoluble state. A significant role is played in these processes by transition metals (such as copper and zinc) that were detected in fairly great amounts in senile plaques of AD subjects. Using a combination of modern spectroscopic techniques and numerical simulations, the authors Morante and Rossi shows that different metals can rival in peptide binding, which suggest that metal dyshomeostasis may be important in the development of AD. Deciphering the role of specific molecular pathways may help elucidate disease progression. Further, such studies are useful to propose and develop specific biomarker(s) and targets for the disease. Collapsin response mediator protein-2 (CRMP-2) plays an important role in neuronal development and polarity and in axon growth and guidance. CRMP-2 is a physiological substrate for GSK3 and Cdk5, two protein kinases that exhibit significant activity in AD. Herein, authors Soutar et al. examine the function of CRMP-2; and how it is controlled by phosphorylation, what changes in molecular mechanisms could lead to the abnormally high CRMP-2 phosphorylation in AD. This is important if CRMP-2 plays a specific role in AD and not in other forms of neurodegeneration. In the context of biomarker, the role of CSF cytochrome C levels and auditory eventrelated potentials (AERPs) in the progress of mild cognitive impairment (MCI) to AD is an important development. Authors Papaliagkas et al. suggest that MCI to AD conversion is associated with markedly elevated N200 latency at baseline and a high elevation of cytochrome C levels in the course of a relatively short period of time. The authors argue that both parameters could be possibly considered as candidate markers to differentiate between AD converters and MCI stable patients. Regarding the pharmacological strategies, cholinesterase inhibitors (ChEIs) and related drugs form the subject matter of another chapter. As the authors Pepeu and Giovannini have rightly pointed out, whereas an increase in brain acetylcholine and an improvement of cognitive deficits have been reliably proven in animal models of AD, from aging rats to transgenic mice, the clinical effectiveness of ChEIs is still controversial. The possibility still exists of ChEIs exerting their effects through mechanisms other than cholinesterase inhibition. Diverging opinions on clinical efficacy do not discourage researchers from developing new ChEIs, particularly multifunctional ChEIs. They still exemplify the future of cholinergic therapy, not only for AD but also for vascular dementia and MCI. Another hallmark of AD is oxidative stress resulting from the body’s inability to neutralize excessive reactive oxidizing species (ROS). The mechanisms responsible for oxidative damage include iron deposition and mitochondrial insufficiency in brains of AD subjects. Heme oxygenase-1 (HO-1) is a 32 kDa stress protein, which is significantly over-expressed in AD-affected temporal cortex and hippocampus relative to control preparations. Targeted destruction of glial HO-1 hyperactivity may prove to be a logical and effective neurotherapeutic intervention in AD and related neurodegenerative disorders. Authors Schipper et al. describe efforts to determine whether systemic administration of a novel, selective and brain-permeable inhibitor of HO-1 activity improves cognitive dysfunction and neuropathology in a transgenic mouse model of AD, and such research has a great translational impact. Regarding non-pharmacological strategies, authors Raglio and Gianelli focuses on the potential use of music therapy in a specific application distinct from generic use of music in a variety of pathologies. The authors highlight the therapeutic nature proper to music therapy with specific reference to the domain of the dementias. Apart from its controversy music therapy accelerates expression, communication and interpersonal relationship in a non-verbal context. Regarding mechanistic and drug target developmental studies, it is important to use and develop an appropriate model that closely mimics the features of (human) AD. The most common animal models currently used for AD research are transgenic mice that express a mutant form of human Aβ precursor protein (APP) and/or some of the enzymes and molecules implicated in their metabolic processing, such as BAC1 and presenilins. However, these transgenic mice carry their own endogenous APP and APP-processing enzymes, which may interfere in the production of different Ab peptides encoded by the human transgenes. In this context, authors Sarasa and Pesini suggest that important information on the physiopathology of AD could be obtained from other natural non-transgenic models. They have analyzed the chick embryo and the dog, which may be better experimental models, as their enzymatic and cellular machinery for processing APP is almost identical to that of humans. Regarding improvement in diagnostics, post mortem identification of amyloid plaques, consisting of the Aβ peptide, and of neurofibrillary tangles in the brains of AD patients is still the gold standard for diagnosis for AD. Significant attempts have been made to detect reliable biomarkers for AD that can be used for early diagnosis. For example, body fluids, such as CSF and plasma, of AD patients are used to detect levels of total or soluble Aβ peptides. Here, authors Funke et al. present an updated overview of the current status of development of assays for Aβ aggregate specific detection and quantification. Apart from detection of soluble Aβ peptides, it is increasingly recognized that several neurodegenerative diseases, including Alzheimer's, Parkinson's, and prion diseases, are characterized by intraand/ or extracellular deposition of fibrillar proteinaceous aggregates and by extensive neuron loss. However, the dynamic and metastable nature of Aβ oligomers makes their study difficult. Herein authors Rahimi and Bitan review structural, functional, and biological experiments that are employed to study nonfibrillar Aβ assemblies. They point out challenges and highlight future research prospects in this important field relevant to not only to AD but other neurodegenerative disorders also. Two chapters cover morphological aspect of the disease. First, dendritic spines are important sites of neuronal contacts, and alterations in the activity of neurons directly affect spine morphology. Indeed, spines are greatly dynamic structures and spine shape correlates with the power of synaptic transmission. Investigators Brandt et al. provide an overview on spine morphology and function, and describe different experimental models to analyze spine changes and dynamics. The review discusses potential mechanisms of how disease-relevant factors influence dendritic spines and how spine alterations could be therapeutically blocked or overturned. The second morphological chapter deals Zach et al. with the examinations of alterations in brain asymmetry, which often focus on the planum temporale of patients with schizophrenia. Notably, recent data also suggest changes in laterality of demented patients associated with a more marked impairment of the left hemisphere. The plana temporalia were assessed using a new volumetric method with dental resin matter. Interestingly, shifts to left/right laterality of areas and volumes were detected in all demented groups. In the more prevalent AD group, the change in laterality of an area was associated with a mild decrease on the right and a mild increase on the left side. Finally, authors Lu and Haase present experience and perspectives of caregivers of spouses with MCI. They describe commonalities of the lived experience of being a spouse caregiver of a person with MCI. In short, the volume 2 captures a window, in the form of 15 exciting chapters, of stimulating ideas dedicated to the latest advances in AD research, diagnosis and treatment. This effort would enable the researchers in identifying the most critical gaps in our knowledge that require filling. We plan to prepare the future volumes of the series Advances in Alzheimer’s Research that will discuss, debate and report several other pivotal hypothesis-driven strategies and thought-provoking ideas, which would help us in understanding the neurobiology of AD, and in potentially halting the progression of AD, perhaps a combination of approaches that may ultimately prove to be most effective, as found in other diseases. Finally, I express my sincere gratitude to the authors for the value of their excellent contributions, their perseverance for the peer review process, and their patience for publication. Both the publisher and I appreciate the researchers who assisted in the peer review process, checking and correcting various chapters and the editorial. I sincerely appreciate the authors, publisher and staff of Current Alzheimer Research for their advice, efforts and support in the creating of this eBook series, specifically this volume.